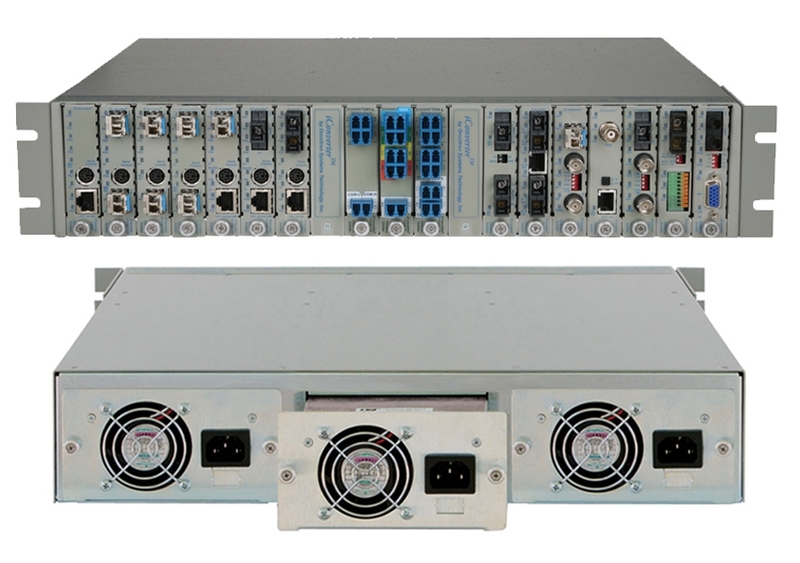 The 2U (3.5 inch) high iConverter 19-Module Chassis has triple-redundant power supplies and can be mounted in a 19-inch or 23-inch rack. It is designed for Enterprise Local Area Network (LAN) and Metropolitan Area Network (MAN) applications where fault tolerance and a high-density rack footprint are essential. The iConverter 19-Module Chassis is designed for Enterprise Local Area Network (LAN) and Metropolitan Area Network (MAN) applications where fault tolerance and a high-density rack footprint are essential. The 2U (3.5 inch) high iConverter 19-Module Chassis supports up to three power supplies for redundancy, and can be mounted in a 19-inch or 23-inch rack. The 19-Module Chassis features up to three hot-swappable, redundant power supplies. Universal AC, 24VDC and 48VDC powering options are available. The power supplies operate in load-sharing mode to reduce the burden on each power supply to extend the lifetime and fault tolerance. Power is provided to the nineteen iConverter modules installed in the chassis via the chassis backplane. When used with an iConverter management module, the management capabilities include the ability to monitor the voltage, current and temperature of each power supply. Any out-of-range violation can trigger an SNMP trap to allow quick corrective maintenance. In addition to handling the power and management data for each iConverter module, the 19-Module Chassis backplane allows sharing of Ethernet data between the individual modules. 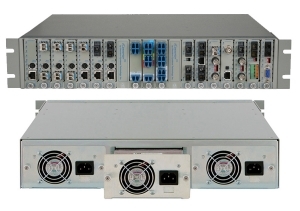 iConverter modules that are installed in adjacent slots and equipped with Ethernet backplane ports have the ability to connect to each other via the chassis’ Ethernet backplane and facilitate a variety of flexible management options including unmanaged, out-of-band managed, in-band managed and multi-port configurations. The high reliability of the redundant power system combined with its AC and DC power options and its ability to hold nineteen modules in a 2U height make the iConverter 19-Module Chassis the ideal choice in the core of an enterprise, in a Central Office (CO) or for Point of Presence (POP) applications where reliability and space are critical. The iConverter 19-Module Chassis supports the entire family of iConverter fiber media converters. All iConverter modules are hot swappable and support multiple mounting options. Fixed parameters that can be monitored on the 19-Module Chassis include the chassis type and model, manufacturing information, along with hardware and software revisions and serial numbers of the power supplies. In addition, the power supply modules can generate SNMP traps for out of voltage or chassis temperature range violations. All of these events can selectively enabled or disabled to generate SNMP traps. W: 17.15" x D: 14.0" x H: 3.5"
High Airflow power supplies (120W) cannot be installed in the same chassis with other types of power supplies. 19-Module chassis does not support dying gasp.